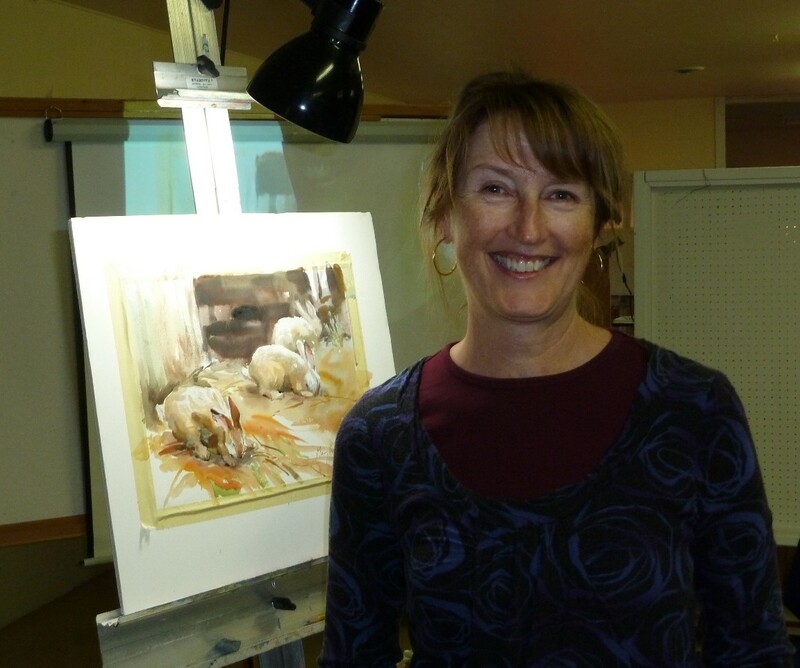 Seabrook artist Mary Whyte had a surprise note in her mail one day. Her manager called her and said, “You are not going to believe who wrote to you today.” It turns out to have been a handwritten note from former President George W. Bush. Mary had sent the former president a book of an art exhibit of hers called the Working South. She had seen a book he wrote called Portraits of Courage: A Commander in Chief’s Tribute to America’s Warriors. There are 66 portraits of military veterans who had been wounded. The president painted head and shoulder portraits of each veteran and wrote about each one. Mary was moved by his book and she wrote to the president wishing him well in his endeavors. She hardly expected to hear back from him, so his return note came as a great surprise. His note said, “Dear Mary, you’ve picked the hardest medium, watercolors. Next time you’re in Dallas let’s talk ‘art.’” He enclosed the card and telephone number of his personal assistant. Mary called the assistant and was surprised when she said, “Oh yes. You’re the artist.” They proceeded to pick a day when a visit would be possible. The assistant helped Mary get a hotel room in Dallas close to the Presidential Library. Mary had to be vetted to get through security. Mary called the assistant before she left, asking what the appropriate dress would be. The assistant let her know the president would be in a suit as he had appointments later in the day. Mary wore a navy blue suit, with a rhinestone pin depicting the American flag. George W. Bush has a Presidential Library and Museum located on the campus of Southern Methodist University. Mary was able to walk to the library from her hotel, and she was met by the Assistant to the Chief of Staff. The personal assistant escorted Mary to former-President Bush’s office, which is nicely decorated with some antique furniture, plus paintings mostly by Texas artists. Coffee appeared immediately and the conversation centered primarily on painting. Bush asked how long she had been painting, what artists she admired most, which ones had the most effect on her work. They asked each other what paintings they were working on at the moment. They talked about Winston Churchill who had taken up painting during his career as a politician and written a book called Painting as a Pastime. When you look up Churchill’s book on the web, it often appears next to George W. Bush’s book on wounded warriors. Bush asked Mary if she had seen his book. She said she had but only a friend’s copy. 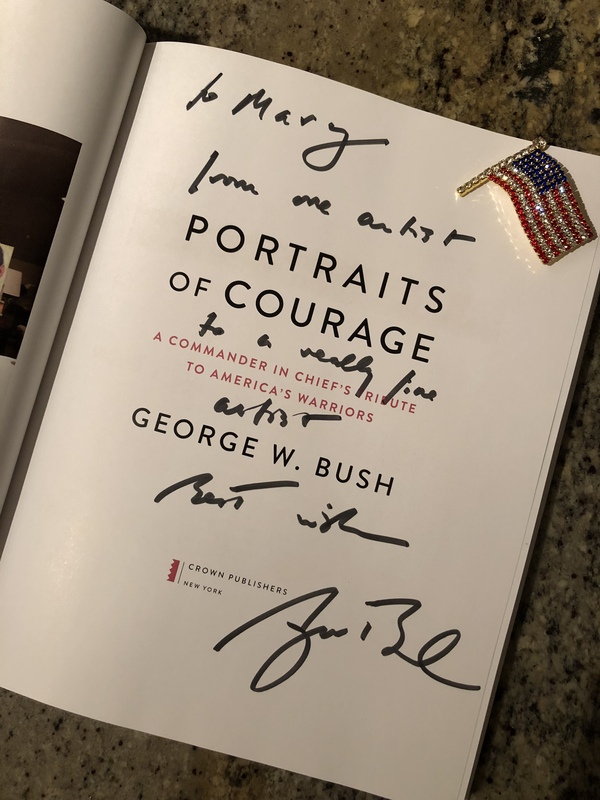 He gave her a copy of his book, which he signed: “From one artist to a really fine artist.” Mary took a picture of the autographed page putting her pin of the American flag in the upper corner. The Chief of Staff personally escorted Mary to the Bush Museum. Only 20 presidents have a presidential museum and Mary spent 2 hours going through it. The museum is open to the public. It is filled with Bush memorabilia such as a butterfly ballot from Palm Beach, Florida, a replica of Mr. Bush’s Oval Office, the bullhorn he used at ground zero and a gnarled steel beam from the World Trade Center demolished on September 11, 2001. We are all so proud of Mary and her impressive artistic output. We are also impressed by the recognition her art received from a former president. This entry was posted in Spotlight on Seabrookers. Bookmark the permalink. Being personal friends of Mary’s, it is a proud moment to know God brought this wonderful opportunity to Mary. Without a doubt, when President Bush met Mary and when Mary met President Bush, they were both in awe of one another. Mary is a warm and genuine woman with a loving heart. I am sure President Bush saw that in her as well. God Bless President Bush and God Bless my dear and cherished friend, Mary Whyte. Mary, you deserve every accolade you have received and I am hoping for even more. My wife and I followed ” Working South” from Greenville County Museum, where the docent was from Virginia in a town with a drive in Movie Theater to Savannah. We went to your gallery in Charleston and I bought your book and inside along with your signature is a drawing of a shrimp. It is one of my favorite things and as an artist I refer to it often. I have several other of your books and videos and having spent time on Botany Island and visited the live oak tree near John’s Island…I can but marvel at your success. It is a rare thing for any artist to achieve what you have done since moving South and befriending your Gullah neighbors. I greatly admire you and your work, the former President’s visit was just icing on your already 8 layer cake. Thanks for sharing your talents and yourself to artists and the viewers of your work that moves people with every brushstroke. Godspeed!! !